Home »Alabama»#ThrowBack Thursday! 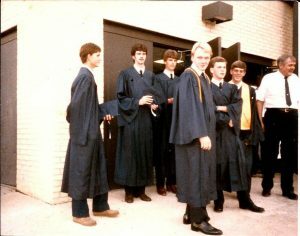 1985 Graduation. Me in the foreground. June 5th, 1985. 1985 was a magical year. Graduating from Plainview High School was filled with bittersweet moments. In so many ways, we were ready to take on the world. In other ways, slight sadness stirred within me as I realized we weren’t coming back together the following year. This was also the last day I saw some of my friends since they moved away to pursue college goals in different states. Our lives were about to change, and this picture is a moment frozen in time that I cherish. Fond memories. Good times. One of the greatest surprises on graduation night was seeing my older brother, David, after the ceremonies were over. I didn’t know he was coming, and it was a wonderful moment. His arrival more than made up (by 1000%) for my father not coming to see an important event in my life. Words cannot express my gratitude for David taking his time to share that night with me. My spirits were lifted. In the background with the golden sash was my best friend from 1st grade until the 12th. Ed Rogers. We shared a lot of good times growing up. When I played basketball for Plainview, his family was generous enough to allow me to spend the night when our games were away. Otherwise, I’d never been able to play basketball, as my mother had no way to pick me up after those games. Ed’s father, Curtis, was a fantastic person. His whole family was. Curtis offered me fatherly advice because he knew my father had abandoned us. He offered me encouragement. There was a warmth in the Rogers’ family. Something I didn’t have at home, and all the more reason I enjoyed those nights when our basketball games were away. Somehow, Ed and I lost connection after graduation. I left for Berea College, and he went to Auburn University. This photo was at one of the last times we saw one another. We got together at at least once with Alan Shankles, also in the picture, and Jeff Cole (not in the photo), during the summer before leaving for college. Jeff and Jody Higgins also went to Berea, so it made the transition of moving to Berea a lot easier. We picture our futures before graduation, but seldom do those dreams come to fruition. College was where I met more wonderful friends and had some of the greatest professors that shaped my goals in different ways. I came to new crossroads where I had new decisions to make. I knew at an early age I wanted to be a novelist, but I loved biology (entomology in particular), too. I pursued my biology degree first and later a Masters in creative writing, meshing the two schools into fictional works. I’m thankful I did. Sometimes, I see the old me in the picture and wish I could go back and shake myself with the knowledge I’ve gained over the years. But … you know what? If it meant losing what I have today by doing so, which no doubt, it would; I wouldn’t do it. I wouldn’t be the person or writer I am today if not for all the bumps in the road. The betrayals by certain people shape us. The hardships toughen us. When pressed against the wall, you either crumble or come out swinging. I fought back. I fought the mental urge to give up when pressure from all sides tried to crush me. Surviving those oppressive times changed my perspectives and my goals. I became a better person. Yep, a lot of bad things happened in the past. That’s where they’re buried. And despite all that, I’m pleased with the blessings I have today.